Bane is a voracious reader. He speaks six languages and is highly trained in weapons, combat tactics and military staregy. His strength and stamina were increased tenfold while using the adrenocortical steroid Venom. Bane has now beaten his chemical dependency on the drug and now relies solely on his natural gifts. 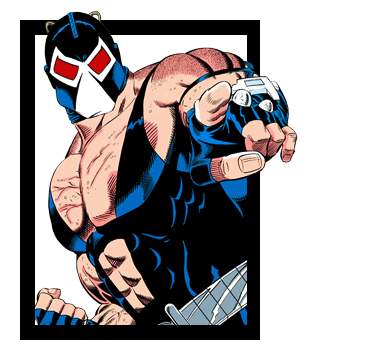 History: Born to serve the life sentence of his father, Bane's childhood and early adult life was spent behind the walls of Pena Duro, the infamous prison/fortress of Santa Prisca. At the age of approximately eight he killed the first of many men confined with him. He spent extended periods of his imprisonment in the Cavidad Oscuro, a solitary hellhole reserved for the worst of the worst. After more than three decades Bane was made the subject of experiments with Venom, a gene altering drug capable of giving its user tremendous strength in exchange for his sanity. 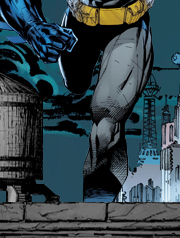 His enormous physical strength and capacity for rage amplified by the poison in his veins, Bane effected an escape from Pena Duro for himself and three comrades. Free for the first time in his life, Bane made for Gotham City where he soon disabled the Batman and ruled Gotham's underworld until brought down by Jean Paul Valley, pretender to the mantle of the Bat. Since that time he has threatened Gotham and the world alone and at the side of Ra's al Ghul. He is currently at large and expected at any time to renew his campaign to destroy Batman and rule Gotham.